Lockit for U-Shape Slot - Bolt Products Inc. Assembly friendly. Independent of insertion into the panel, Lockit Strain Reliefs self-lock onto the cable. Thus, they may be preassembled offline for final assembly at a later time or remote location, for lower installed cost. Large mounting hole design allows passage of plugs or bulky assemblies during Lockit installation. Lockit Strain Reliefs hold so well they pass the UL pull-out test requirements with or without panel support. They protect the lifeline of your electric/electronic products by absorbing the forces of push and pull that may be exerted on the flexible power cord. And, their rectangular design eliminates the possibility of part rotation under forces of twist. Fingertip pressure snaps the Lockit into the mounting hole. ST-101A designed to be installed in a U" shape slot. 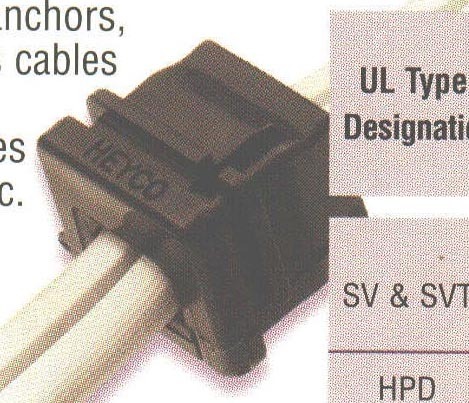 Securely anchors, insulates, and protects cables at panel entry point. Slim head profile makes Lockits’ design-specific.